Heirloom of violence What legacy will we leave to children affected by gun deaths in America? My wife owns jewelry and watches that belonged to her grandmother. My parents have the American flags that were draped on the coffins of their military veteran fathers. I have some watches and a quilt my mother made for me. At some point, our three children will inherit these and pass them on to their kids. Most of the value of these tangible objects is sentimental and derived from our families’ history. These heirlooms will outlast us and hopefully function as physical reminders, to our kids and future grandkids, of the virtues and legacy of trial and triumph in their bloodlines. What legacy will we leave to children affected by gun violence in America? Though the past few days have been full of chilling videos, the most penetrating sounds and images were those of the children affected by the most recent rash of police-related killings. Toward the end of the Philando Castile shooting video, Diamond Reynolds’ 4-year-old daughter could be heard trying to console her mother, saying “It’s O.K. 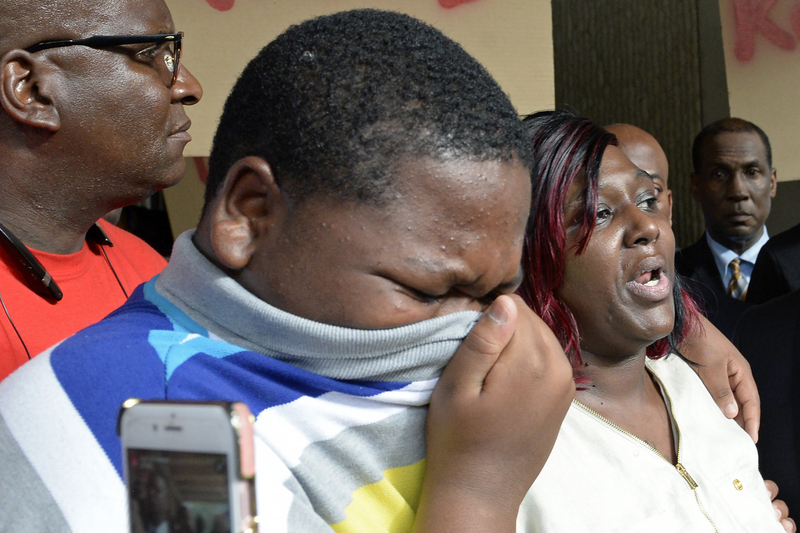 I’m here with you.” At the family news conference following Alton Sterling’s death, the oldest of Sterling’s five children, 15-year-old Cameron, covered his face and wept, crying out, “Daddy,” as his mother struggled through a prepared statement. Those children’s lives, in those brief moments on video, will forever haunt them and us as a nation. Of the five Dallas officers killed in the ambush on Friday, three were fathers. Their children were not present for the deaths of their fathers or crying in front of a gaggle of media after the tragedy. But in articles days after the Dallas ambush, their kids can be seen smiling with their fathers, in old photos pulled from social media. Sgt. Michael Smith leaves behind two daughters, ages 14 and 11. While those girls are old enough to understand the danger their dad faced, they had to expect for him to return home as he had always done. Instead, those young ladies will navigate their teenage years, without the much needed presence of dad. Brent Thompson, the first officer killed in the Dallas ambush, raised six children to adulthood and has three grandchildren. Brent won’t be around to fulfill his most important responsibilities as a grandfather: spoiling his grandkids and being the always available free babysitter. Officer Patrick Zamarripa was a father to his 2-year-old daughter, Lyncoln, and step-father to third-grade son Dylan. Zamarripa won’t be around to pass that reassuring message of fatherly love on to his children. Zamarripa, like the other men killed in Dallas, Falcon Heights, Minnesota and Baton Rouge, Louisiana, won’t be able to decide what they will leave to their children. The heirlooms and legacy left to those kids will be that of violence and injustice. The impact will be tremendous and most concentrated on those aggrieved children. But all children of all strips who have suffered from the death of a parent from senseless gun violence are aggrieved. And it will be felt by my kids and all kids in this country, too. Alton, Philando, and the Dallas Five are gone forever and can no longer affect the country and communities we live in. But we can, and we must. The American heirloom of violence and injustice remains intact. Despite the fact that gun violence in America has been on a downward trend since the 1990s, we haven’t done enough. In response to a rise of mass shootings in the U.S., our country hasn’t done anything, but mourn. In response to the Black Lives Matter movement, some point to black-on-black crime in cities that offer little more than hopelessness. And in response to the lack of opportunity for many of America’s youth, our country offers prison. In response to last week’s deaths, our country will again offer nothing. Because our country is us. And we are unwilling to accept responsibility for perpetuating the culture that led to these events. Though we should advocate for laws to address gun violence and injustice, that is not enough. The true lasting actions will be through how we shape the thinking of our children. Shamefully, the heirlooms we are leaving our kids will only remind them of trials, no triumphs. They’ll be reminded that we reacted to a fire with a tear.